Twenty-five years ago, Michael O’Higgins showed the world how to beat the market. His 1990 international bestseller, Beating the Dow, explained a simple strategy that anyone could follow. It took ten minutes a year. Investors with the discipline to follow O’Higgins’ method since his book’s publication would have made a small fortune. From 1991 until 2016, his strategy gained an average compound return of 12.76 percent per year. In a tax deferred account (not including transaction costs) it would have turned $10,000 into $201,315. Investors in Vanguard’s S&P 500 Index (VFINX) would have averaged a compound annual return of 9.7 percent per year. The same $10,000 would have grown to $101,265. After getting on track, he earned a B.Sc. in economics. O’Higgins worked at a couple of investment firms before he opened his own money management firm in 1978. He immediately began looking for a reliable investment method. “When everyone is placing their bets on the hare, maybe the safer, surer bet is on the tortoise,” he says. He backtested two methods. One of his methods called for buying the Dow’s 10 highest dividend yielding stocks. He called this strategy, Dogs of the Dow 10 (DOTD 10). The second method­­–which had an even better backtested record–called for buying the 5 lowest priced stocks among the top 10 yielders. He called this method Dogs of the Dow 5 (DOTD 5). Steady or growing dividends are a sign of financial strength. O’Higgins said investors should buy these stocks and hold them for a year. After 12 months, investors would need to see if the same stocks still met the standard. Those that didn’t would get sold and replaced by those that did. This year’s Dogs of the Dow 5 include Pfizer (PFE), Cisco Systems (CSCO), Verizon Communications (VZ), Merck (MRK) and Wal-Mart (WMT). As of March 3, 2016, their dividend yields were 4.01 percent, 3.87 percent, 4.36 percent, 3.53 percent and 3.02 percent respectively. This year, the dogs are already running. So far, the Dogs of the Dow 5 are up 2.69 percent. The Dogs of the Dow 10 are up 3.7 percent. By comparison, the S&P 500 was down 2.06 percent. Both strategies have trounced the S&P 500 since Beating the Dow was published. But the Dogs of the Dow 5 (much as they did in the up to 1990 backtested study) beat the Dogs of the Dow 10. 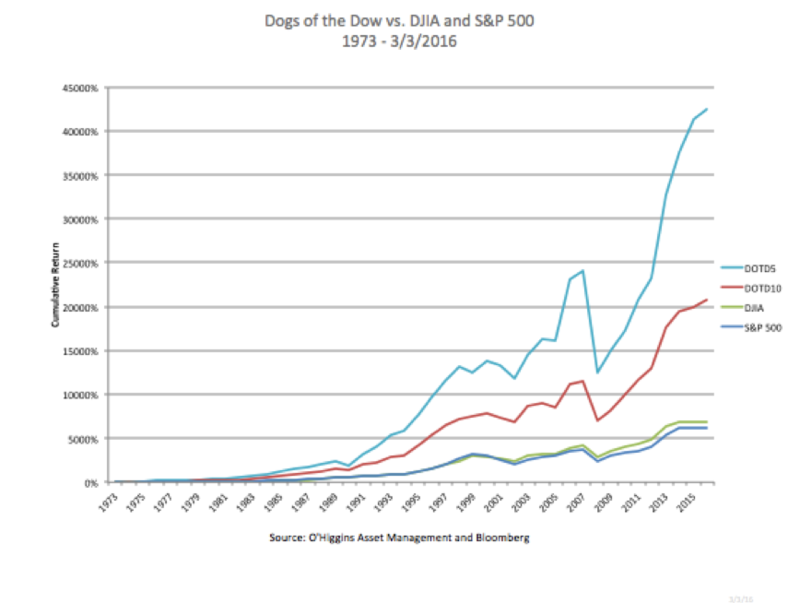 Not including taxes and transaction costs, the Dogs of the Dow 5 beat Vanguard’s S&P 500 over the past one, three, five, ten, fifteen, twenty and twenty five year periods. But if you’re looking for a strategy to beat the market every year (or even every five years) you’re not likely going to find it. Vanguard’s S&P 500 beat the Dogs of the Dow 5 in two of the 5 year periods between January 1991 and December 31, 2015. *Returns above are compound annual averages. Will the Dogs of the Dow beat the market over the next 20 years? I think so. But it doesn’t mean that you or I will have the strength to keep them in our portfolios. If the market turns into a greyhound, the high dividend dogs are going to look slow. Imagine this. In January 1995, your friend invests $10,000 in Vanguard’s S&P 500. He turns $10,000 into $35,027 after just five years, averaging a compound annual return of 28.5 percent. That’s how much the index gained between 1995 and 2000. Those were greyhound years. Over the same time period, you invest $10,000 in the Dogs of the Dow 5. It turns $10,000 into $21,094. That’s a compound annual return of 16.1 percent. The index trounced the dogs. Could you doggedly stick to a plan that might underperform for a decade? If so, you might be able to collar the Dogs of the Dow. History is in your corner. The strategy makes sense. But at times, it will test a level of patience that few investors have.